Support in technical analysis can be categorized into major support and minor support. The type of support will have different significance. 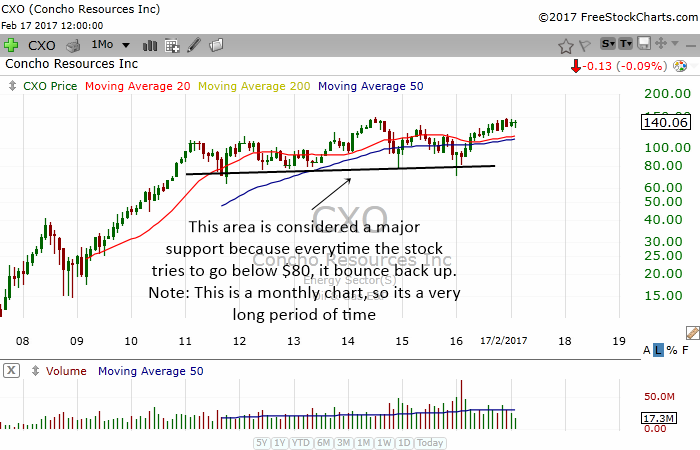 Generally, major support has more ability to keep a stock from dropping. You can observe price congestion by the number of candles that are lumped together. The more candles, the more trading activity has taken place. And that also means more money is being committed. Therefore, the area represents a very powerful support area that should keep a stock from falling. The chart above shows the daily chart of QQQ. From August to December, this etf has been trading in a range with lots of price congestion. 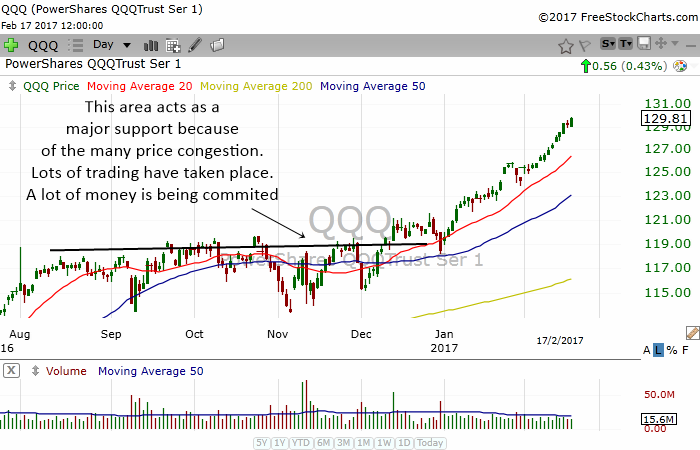 The area formed a floor which will act as a major support if QQQ falls in the future. Major support can be noticed very easily using longer term charts such as the weekly charts. 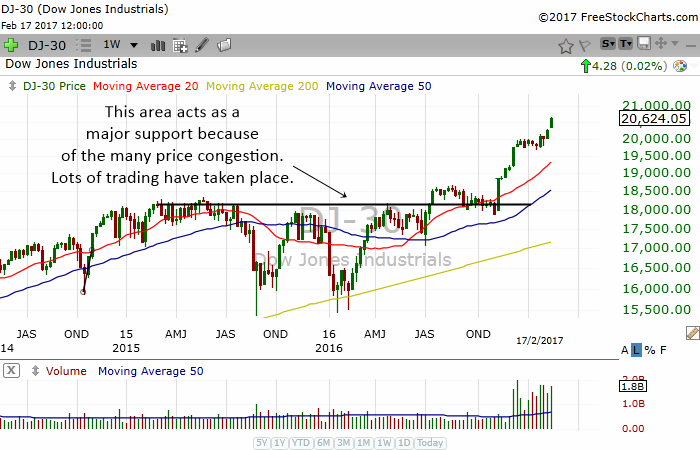 The chart above shows the weekly chart of the Dow Jones Industrial Average. There has been a lot of trading activity at the 18000 area. Eventually the Dow broke out of the 18000 range and accelerated higher. If the Dow drops in the future, the 18000 area will be a major support area that can help keep a bear move in check. That's because there is a super amount of trading activity involved in that area. When you look at monthly charts, you will often see an area where the stock has always found support. Somehow, the stock just refuse to drop below that area. That area is known as a major support because of its ability to keep the stock from going lower. In the chart above, you can see how CXO found support around $80 time and time again. The $80 area is considered to be a major support. They usually come in a "V" shape. They are also much more shorter in time than major support which usually occurs in weekly and monthly charts. 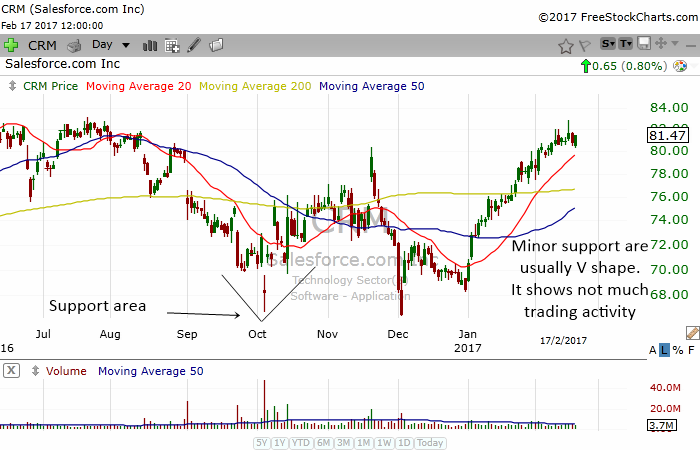 Although they are called minor support, it can act as a very powerful support when a stock is in an uptrend. When a stock is in a bullish mode, only a little support is needed to keep the stock from dropping further. In the chart above, the previous high made in September acted as a minor support. Notice how it kept the stock from falling further when it had a correction in late November. The minor support acted as a powerful support because the stock is already in an uptrend. 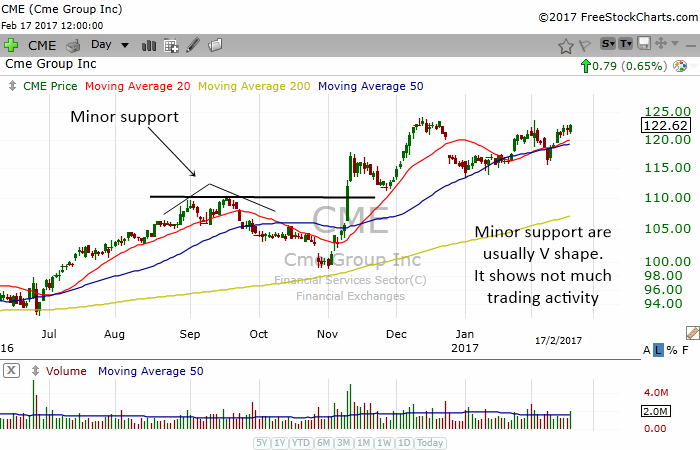 In the chart of CRM above, the previous low made in October acted as a minor support. Notice how it kept the stock from falling further in December. The minor support worked very well because the stock was extremely oversold. It was a climactic selloff and when market participants saw a support area, even if its a minor support, they bought the stock. Another thing to note is that this stock was in the process of forming a double bottom chart pattern at that time. 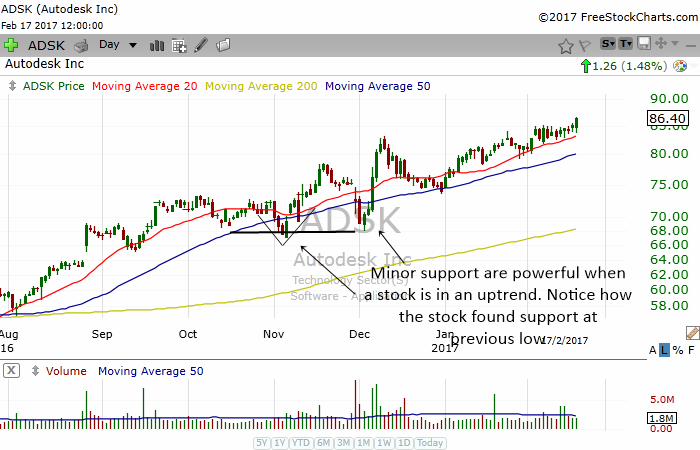 The chart of ADSK above shows us how powerful minor support can be when they exist in an uptrending stock. A stock that is in an uptrend does not need much support to keep it from dropping further.